Shisaku: Who Is Up For A Yasukuni Visit Today? There are people buried there from the 1800s. Only a very small fraction are those convicted of war crimes, I do not see a problem honoring Japanese soldiers. Why does Abe need a bagman to carry his donation. Doesn't Yasukuni take online payments? Actually, no one is buried at Yasukuni. Your defense, coming from a position of profound ignorance, is notable only in its worthless. Bank and credit card transactions, no matter how spiritually fulfilling, make for terrible television. There is some speculation among scholars that some of Tojo ashes are somewhere at the Shrine. The rest are with the family and at a stele on a mountainside. No all of Japan's combatants are honored a Yasukuni. It is selective. There is no all inclusive memorial to all who fought for Imperial Japan or all who died for Imperial Japan. No one has been aposthesized who died after August 15, 1945. 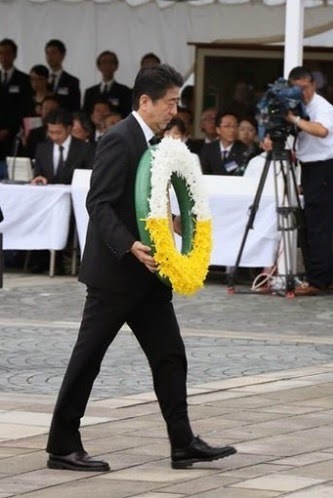 Yasukuni is not about honor. It is about the deification of the Emperor and Imperial State. It is about worship of a failed state.